"Fantasy (in this sense) is, I think, not a lower but a higher form of Art, indeed the most nearly pure form, and so (when achieved) the most potent." -J.R.R. Tolkien, March 8, 1939 lecture "Fairy Stories"
Tolkien's parenthetical "when achieved" is the kicker of that statement, the acknowledgement of how difficult and rare successful fantasy really is. You know it when you see it. This reviewer did not find that quality in "An Unexpected Journey", the first installment of Peter Jackson's gigantic trilogy based on Tolkien's slim one-volume classic "The Hobbit," but it is there in spades in part two, "The Desolation of Smaug." This middle chapter is about a half-hour too long, and the final third splits the story up into three pieces, weakening the narrative thrust that had been building, but no matter: By the time we get to Bilbo Baggins' confrontation with the dragon Smaug (voiced with delicious sneering evil by Benedict Cumberbatch), the real work has been done. The thematic elements are in place, the emotional tension is highly strung, and the action unfolds in a wave like the fire erupting from the dragon's mouth, overtaking all in its path. Except for a flashback which shows Gandalf (Ian McKellen) and the exiled dwarf king Thorin Oakenshield (Richard Armitage) joining forces in a dark and beer-soaked pub straight out of Chaucer's "Canterbury Tales", "The Desolation of Smaug" picks up where the last one left off, with Bilbo (Martin Freeman) and the posse of rowdy dwarves deep into their journey to reclaim the Lonely Mountain and the dwarves' lost kingdom. Bilbo, dragged reluctantly from his comfy hole-in-the-ground in the Shire in the first film, is now resigned to his fate, and shows resourcefulness and pluck in one harrowing situation after another. He's also got that mysterious golden ring he found in the goblin tunnel—the one that seems to make him invisible, the one that nobody else knows about, not yet. It will come in handy. Gandalf tries to keep the team together, but forges off on his own solitary spell-breaking mission (which Tolkien's book suggests is undertaken by Gandalf to force Bilbo to gain the trust of the dwarves on his own). Along the way, the heroes find shelter in the home of a shape-shifting Giant-slash-Bear, and are pursued by a galloping army of Orcs. To save time, they cut through the Mirkwood Forest and run into a terrifying herd of gigantic attacking spiders, in a scene doomed to give me nightmares for months. (I have barely recovered from reading that scene in the book when I was 10 years old.) Saved and then imprisoned by the isolationist-minded elves, the dwarves and Bilbo find a way to escape in a bunch of barrels down a river, being attacked from the banks by orcs and elves alike. Some old friends show up: cool-eyed Legolas (Orlando Bloom), and Galadriel (Cate Blanchett). There's a new elf in town, Tauriel (Evangeline Lilly), who is drawn to one of the dwarves; the romantic triangle she sparks has nothing to do with anything, but it is still nice to see Tauriel act as a deus ex machina on a couple of occasions. Stephen Fry has a great cameo as the Master of Lake-Town, a despicable and gout-ridden person lording it over his fearful constituents from on high; it's a Dickensian piece of scene-chewing. Jackson and his team have a lot of fun creating these three-dimensional worlds, overwhelming us with different moods, energies, and personalities. Some of the images are breathtaking: the Long Lake swathed in mist with mysterious structures rising out of it; the misty dark wood filled with shadowy waiting creatures; the elegant vertical fortress of the elves, soothing and yet rigid, too, indicating the elves' unwillingness to get involved in the larger dark forces overtaking the outside world. The final confrontation with the dragon, when it comes, is worth the wait (although it would have been nice if the wait hadn't been quite so long). The dragon's lair is gorgeously imagined, an undulating and ever-changing landscape of coins and gold. 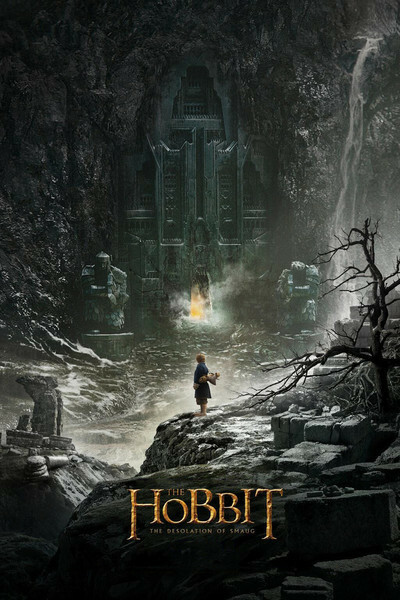 There are lots of great moments: a gigantic tapestry falling from the wall in a rippling wave; huge collapsing columns; tiny walkways over the abyss; the dwarves' visible awe at their ancestors' ingenuity and power. Throughout, you get the sense that you really are in a lost and glorious world. There's a moment before the spider attack that perfectly aligns us with the overall intent of Tolkien's fiction. Bilbo is told to climb one of the trees to peek out of the top of the forest and see how much further they have to go. When he pushes his head through the top, all he can see is a carpet of autumn leaves spreading almost as far as the eye can see, with blue butterflies flitting about along the leaf-tips. The sun shines brightly, and for a moment Bilbo is awestruck. We know that what happens next is bound to be grisly and terrible. But beauty is there to be appreciated, and the hobbits, with their love of homey nature, pretty colors, and comfort, know this as well as we do. It was the love of home that kept people going in the dark years during which Tolkien wrote these volumes, when the shadow of war overhung Europe. The sunlight-drenched green fields of the Shire are long gone by that point in Bilbo's story, a distant memory, but the memory gives Bilbo his power. It is worth fighting for.